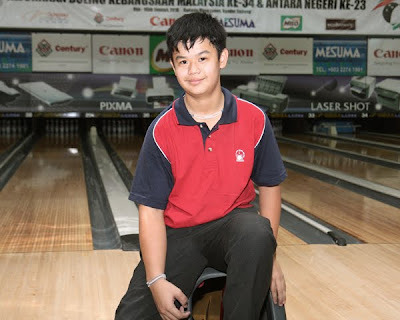 Melaka’s Jason Syow Huay Tik who won the 23rd Interstate Bowling Championship singles gold medal in the Youth category at the Sunway Mega Lanes this afternoon, is a talent to watch. 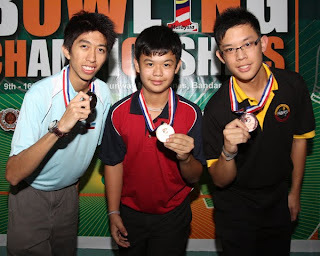 Jason who only turns 14 on July 16, outshone many of his older opponents, to win the title with a total score of 1352 over six games, and an average of 225. He even almost had a perfect game, in his third game, when a single pin denied him the honour. He had lines of 236, 194, 299, 235, 205 and 183. Sabah’s Ozzer Othaman (left) finished a close second with a total score 1345, while Sarawak’s Daniel Tan (right) won the bronze with his total of 1305. Jason who is a Form Two Melaka High School student, on Sunday night, had won the Boys singles title in the Peter Yap Memorial Cup championship for Under-14, which was the kickoff to the Interstate and National championship. Jason got the attention of many at the centre with his prowess, but the soft spoken and modest lad, said that he has a long way to go. However, his achievements two years after taking up the sports, is indeed commendable. He has won last year’s Malaysian Open Graded singles title, gold medals in Under-15 singles and All-Events in the MSSM bowling championship and had finished third in the Milo International Junior All-Stars championship last month behind two Korean bowlers. Jason, the third in a family of three, is the only one who is into sports. Jason owed his prowess in the game to his mother, Jessy Ong. “It was my mother who has given me all the support to pursue the game. I first started out bowling with a few friends and when my mother saw me interested in the sports, she encouraged me,” said Jason. His mother in turn said that Jason since a baby has been interested to play with anything that resembled a ball. “He used to play with table-tennis and tennis balls and had a fascination with anything which was round and would roll,” said Ong a multi-level distributor. Ong got Jason started off with proper training from young, when she used to drive him to Kuala Lumpur on the weekends to attend a development training programme under Sunway Mega Lanes where Micky Un, a former national youth bowler, was the coach. Ong also got former national bowler, Jimmy Lee, who is based in Seremban to assist Jason too. “Jason started to bowl very well when he started bowling at the brand new Melaka International Bowling Centre (MIBC) since it opened its doors on Aug 1,” said Ong. Ong also thanked Wan Ahmad Lofti (Dato Paduka Wan Ibrahim), the advisor for MIBC, who spotted Jason training at the centre and offered discounted rates for the lanes. MIBC now partly sponsor Jason. Ong certainly has no regrets, as Jason certainly proven to have the potential to make the grade. On winning the title yesterday, Jason said: “I am very happy to have won the title especially since bowling with much older bowlers. In the women’s singles, Selangor’s national bowler, Zandra Aziela, was third time lucky when she won the gold medal with her 1,382 effort with an average of 230. Zandra who had won the Youth title four years ago, has been bowling in the senior category the last two years and her best finish was runners-up last year. “I am glad that I finally won it in my third attempt. But I am little surprised too with the win because the competition was keen and the leader kept changing all the time” said Zandra. Siti Safiyah settled for the second spot with her total of 1372 – ten pins behind Zandra – to make a 1-2 finish for Selangor. Sarawak’s Jacqueline Jenelee Sijore and KL's Hee Kar Yen, both national youth bowlers, tied for the bronze medal with their 1331 effort.